History of NASA Buttons - Busy Beaver Button Co.
From the start, the National Aeronautics and Space Administration (NASA) has been an organization pushing boundaries to explore and uncover our galaxy. Since 1958 the mission of NASA has been to educate and inform the American public about their discoveries in formats that reach many—such as the 1969 Apollo 11 moon flight being broadcast live across the nation to the multiple academic articles published every year. One of the most strategic methods used was to produce buttons that put the information of their research and missions right into the public's hands. As a part of Project Mercury, astronaut John Glenn became the first person to orbit the Earth (and the third American in space) on Feburary 20th 1962. On board the "Friendship 7", the mission itself nearly 5 hours. Glenn quickly became a popular household name in America with multiple buttons representing his bravery. Only a few months later, we had our second courageous mission to orbit the Earth. On May 24th, 1962 Scott Carpenter became the second American to revolve around the planet, and the first person to eat solid food in space in the Aurora 7 space capsule. 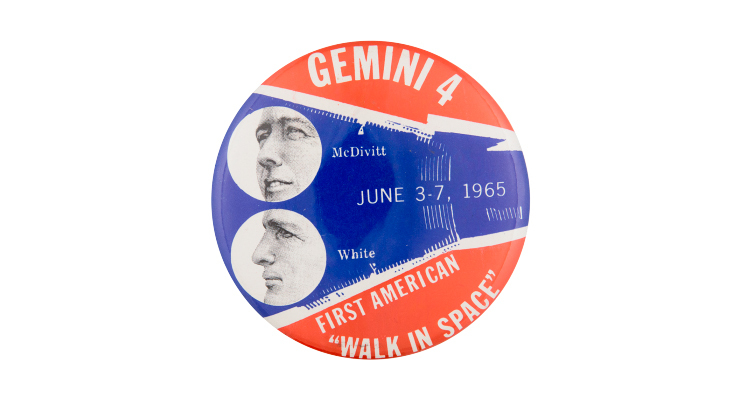 The most notable achievement of the Gemini flights 1 and 2 was that those missions were some of the first "manned" spaceflights, as in our pilot Gus Grissom and his partner John Young manually changed the orbit of their craft. After the date of their launch, March 23, 1965, the men conducted radiation and cell growth experiments. The third mission under the Gemini name was nicknamed "The Unsinkable Molly Brown" after a popular Broadway show at the time. In 1965 the Gemini 4 (Gemini IV) was the first NASA operation that worked with the Houston Mission Control Center. The mission was publicized on as the first spacewalk attempted by an American, Edward White, who spacewalked for over fifteen minutes. The Apollo 8, the first spacecraft piloted by humans was launched from Cape Canaveral, Florida on December 21, 1968. The crew consisted of Frank Borman the mission commander, James Lovell the pilot of the command module, and William Anders the pilot of the lunar mode. The mission provided experience for their next Apollo mission, 11, which brought astronauts to the moon and back. One of the reasons that NASA's space shuttle program was immediately successful was the utilization of their older spacecrafts. 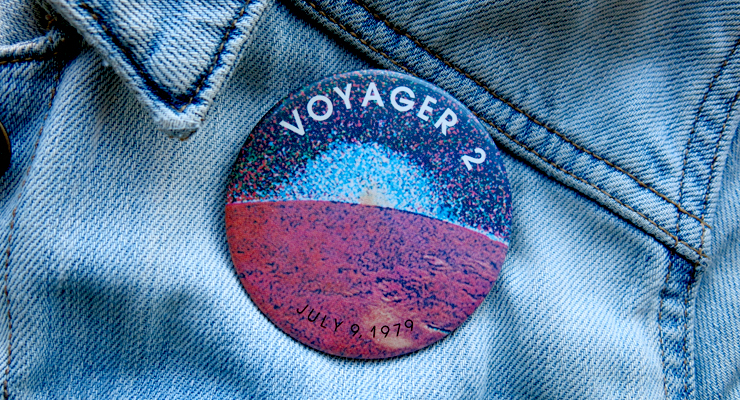 In 1977 Voyager 1 and Voyager 2, two unmanned spacecrafts, were launched into outer space to gather images of planets, their moons, and beyond. As a precaution to anything the shuttle found, the Voyager 2 was equipped with a phonographic record that contained greetings in 55 different languages, sounds, and images that were meant to portray life on Earth. The legacy of these NASA missions has shaped the way the entire world views space travel. The memory of these important expeditions have also luckily been captured on these pins that have survived decades, and will continue to educate the public. For more space buttons, please check out our Button Museum online, or make an appointment to see it in person!